To celebrate its entry as a candidate for the Scottsih Book Trust’s new writer’s award I’ve given my debut novel a new cover and a new rock bottom price (for a few days only) What d’you think? 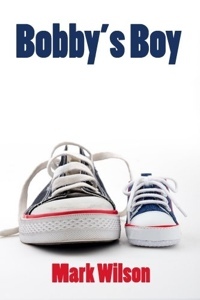 This entry was posted in books, literature, media, personal, popular culture, writing and tagged Bobby's Boy, Book, book cover by MW. Bookmark the permalink. I like the new cover. Looks a lot better. Cheers Phil. How’s things? Book coming along? Things are good. Took a rest from the book over the summer. A local writing group asked me to submit a short story for a ghost anthology, so worked on that. Kids back to school on Monday, so time to get cracking again. Want to have to finished before the end of the year. Is your new one done? Good stuff keep up the good work. I’m going good guns at the moment. Looking like a three book story at present but I’ll see how it goes and when it feels done. Take it easy dude have a good weekend.